When you think of hurricanes, you think of flooding, houses being destroyed, etc. Those things of course are all bad. But in the case of the ginger gold apple something good came out of a hurricane. In 1969, Hurricane Camille did a number on the Virginia coast. It damaged much of Clyde and Frances “Ginger” Harvey’s orchard. Near the edge of their Winesap apple trees, they found a tree that was “different”. And when this tree produced fruit, the apples were yellow not red. It turns out the Ginger Gold got its yellow color from a Golden Delicious. It’s other parents are the Albemarle Pippin and one type that has never been identified. 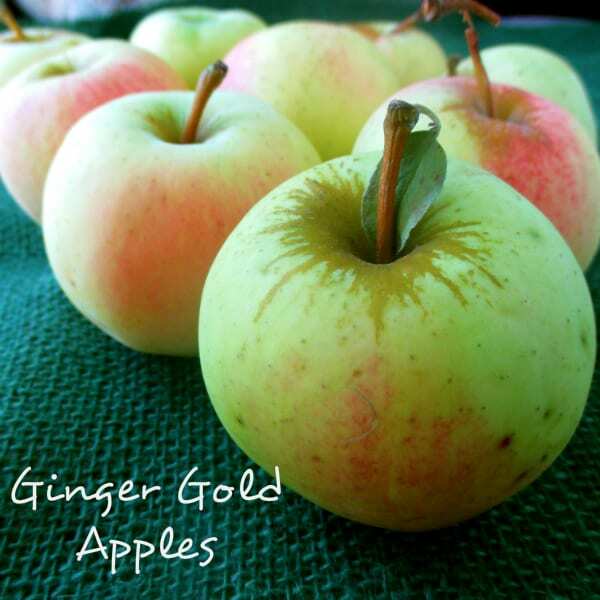 The Ginger Gold is an early apple, one of the first good out of hand eating apples of the year. They are harvested in mid-August, and even early in California. It can be found at farmer’s market, as well as some chain grocery stores. Whole Foods Market carries Organic Ginger Gold apples from Washington. Overall Feeling: When compared to a Golden Delicious, this apple is more tart that gets sweeter and softer with age. It has a mint of spice in it’s flavor when they are good. I often find them to be inconsistent. They need to be picked yellow for best flavor. The first ones on the market each year (around early to mid August) usually have green in the skin and the flavor is very bland. They are at their peak in early September. It’s popular early season aple because it’s one of the few early apples that is not too tart for eating. Besides out of eating, I think this apple works well in applesauce. I used some to make a peach applesauce. The shelf life on this apple is about a month, so buy then up in September. Check out my favorite golden colored apple – the Blondee, a newer variety with the sweetness of a Gala and a floral like taste that is to die for!